Metro Councilor Rex Burkholder‘s support for sustainable farms and food goes back decades. A founding member of the Alberta Food Co-op, he’s also been a working member of Food Front Co-op for 18 years. In the early 80’s, as a board member of Eliot Energy House, Rex secured PDC funds to start one of the first farmer’s markets to serve north and northeast Portland. That long-standing commitment to family farms and local food is a good part of why I’ve endorsed him for Metro President. Another is the event he’s putting on tonight at P:ear. Rex has invited a range of folks from the region’s food world and to discuss the challenges of keeping our food local and fresh and our farmers in business. If you’re as passionate about food and farms as I am, this is our night. I hope you can join me, and help ensure someone with Rex’s commitment to sustainable food is our next Metro President. Food, Inc., King Corn, Omnivore’s Dilemma, and a host of other films and books have identified the substantial flaws in our food supply. These problems seem remote and insurmountable, and the best we can do as individuals is to shift our buying habits. When the Oregon Department of Agriculture (ODA) uses its rules to say frikeh and other traditional farm products cannot be sold in a farmers’ market, it brings a local dimension to the problem. Fortunately, we have the ability to initiate constructive changes at the local level. Farmers’ Markets have been operating in Oregon for almost 30 years. The oldest still operates in Grants Pass. The Portland Farmers’ Market started in 1993 and was originally located in the Albers Mills parking area. These markets allowed nonconventional, small scale farmers to survive. For the first decade or so, the markets were ignored by the ODA. In the mid 1990s, the bureaucracy started to get itchy as markets started to sprout up in urban areas. To address the situation, a couple of market managers sat down with ODA staff and crafted a set of guidelines for vendors. 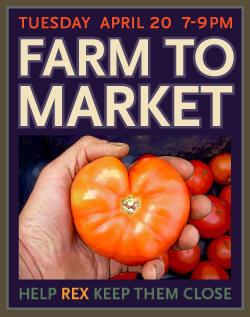 Earlier this year, the agency started an aggressive campaign to increase regulation of farmers’ markets. The agency has decided to draft rules later in the autumn and possibly require licenses for farmers’ market vendors. Was there an incident that gave rise their concerns? No. For three decades, Oregon’s farmers’ markets have operated safely, and without any reported food borne illness incidents. In fact, this exemplary safety record is reflected nationwide. It is clear that factors other than straight forward food safety concerns are behind the move to further regulate farmers’ markets. After all, the food safety challenges are arising from the complexities of the food industry that is already regulated by ODA and other agencies, not the simple open air farmers’ market. Data and science tell us ODA is moving in exactly the wrong direction. In the first installment of “Farewell Frikeh,” we noted that the Oregon Department of Agriculture (ODA) defines “food processing” as the “. . . cooking, baking, heating, drying, mixing, grinding, churning, separating, extracting, cutting, freezing, or otherwise manufacturing a food or changing the physical characteristics of a food, and the packaging, canning or otherwise enclosing such a food in a container.” While this long recitation certainly includes all activities that happen in food processing factories, the definition also covers many traditional farm activities that fall well short of what we consider processing foods. Under a strict interpretation of ODA’s rules, all of the activities identified above must take place within a licensed facility. Because frikeh involves heating and drying, ODA calls it a “processed food.” Like many other traditional foods, including raisins, sun dried tomatoes, dried peppers and herbs, frikeh is prepared outside in the field, and not in a factory. Under ODA’s scheme, if a “processed food” is not produced in a licensed facility, the agency prohibits the sale of the food. If California took such a view of food processing, we would have neither raisins, nor domestic sun dried tomatoes and peppers. Most raisins, for example, are dried on kraft paper trays set out on the vineyard floor. Some of the newer varieties are dried as clusters attached to the trellis, but still outdoors. After learning of Oregon’s approach to regulating food, we decided to see how other states regulate small operations such as ours. What is immediately striking about Oregon is the lack of any stated policy regarding farmers markets or community supported agriculture (CSA) in either the statutes or rules. Although farmers’ markets and CSA’s have strong support among Oregonians, that support has not translated into written policies concerning direct sales. As a result, ODA’s default position is to consider farmers’ markets the same as retail stores. And when farmers stray from the narrow category of fresh fruits and vegetables, they are treated as food processors. It is as if everyone, from a bicyclist to a heavy truck driver, must get the same Commercial Drivers License (CDL). No distinction is made between farm based enterprises and multinational corporations. In fact, ODA has been adamant that no distinction should be made. Several years ago, we started experimenting with various grains at Ayers Creek Farm. Our research led us to an ancient food called “frikeh.” Produced by farmers since Biblical times, frikeh is wheat harvested while still green, then burned (parched) and threshed. The resulting grain is jade green with a grassy, sweet and smokey flavor. The green wheat is more nutritious than mature wheat, and high in fiber. Over the last five years, we have sold frikeh for a short time in early summer. With its smokey quality, our frikeh offers a distinct and exciting variation on normal starchy grains. It is especially popular with vegetarians. Frikeh is prepared throughout the Middle East. Until we began our experiments, there was no commercial production of frikeh in the US. There is a three-day window where the grain, durum wheat, can be burned. It is a rustic process, the grain is parched in the field on sheets of corrugated metal. Once parched, the grain must then be dried outside on screens covered to protect it from the sun and birds. To see traditional frikeh preparation, go here. Frikeh is an ideal crop for small farms which need to add value to overcome the disadvantage they have relative to “economies of scale.”. For more detail discussion of our experience with the grain and its production, go here. Because of a new and aggressive direction taken by the Oregon Department of Agriculture Food Safety Division, we will not be able to sell frikeh this summer. Here’s the problem. The Oregon Department of Agriculture (ODA) has just decided to define frikeh as a “processed food,” same as Spam, Marshmallow Fluff or Fruit Loops. Because it is prepared in the field, there is no industrial facility to license. Last week we were notified by the ODA that we are prohibited from selling frikeh. Mark Bittman of the New York Times has a great run-down today of excellent food blogs. I found Obama Foodorama especially fun (if not, er, a little obsessive) — it’s a blog written by “Eddie Gehman Kohan, a food writer and agriculture policy wonk” about food and the Obamas. The White House sounds like a great place to cook (and now, grow food!). Nicest of all, however, was seeing the mention of Farm favorite Rebecca Gerendasy’s Cooking Up a Story. As 47th Avenue Farmies may recall, Rebecca’s done a few smart video pieces on Laura and the farm (links are here). In a cool little video short just posted on the New York Times site, reporter Adam Ellick visits a former college professor who gave it all up to live on a self-sufficient farm with her partner, Sam Warren. As Dr. Jill Swenson scrapes the icy ground for potatoes, it looks mighty cold up there in upstate New York, but as she and Sam sit down to talk inside the farmhouse, you can see the glow on her cheeks surely absent when she was, in Ellick’s words, “a deadline-obsessed drill sergeant” of a journalism professor. Definitely worth seven minutes of your time, here. As they expressed their steadfast determination to live as purely off-the-grid and off the land as possible, it made me wonder if their experience might be one answer to a provocative article in Mother Jones I’d just stumbled upon, about what a truly sustainable food system might look like. On Warren Pond Farm isn’t exactly a commercial farm (it makes what little money it does by selling some livestock and a little seasonal produce, as well as hosting a cabin for agri-tourism — more here), but Jill argues that their little patch of land could easily feed a family of four. So is that model scalable? Is a nation-wide network of family farms a viable antidote to the perils of petroleum-based agribusiness? When ReadyMade Magazine asked five artists “to reimagine the populist poster art of the first Great Depression,” artist Christopher Silas Neal chose a topic near and dear to our hearts: eating local. A riff on the Victory Garden program from the ’40s, his poster uses the design sensibility of the era to talk about what our priorities should be today. Solving the world’s energy and food problems would do a great deal to strengthen the global economy, prevent disease, and reverse the effects of climate change. The original Victory Garden program was designed to ease pressure on the public agricultural supply and support the war effort by encouraging families to grow their own food. I wanted to expand this idea to the broader concept of buying and eating local food. You can download a PDF version of the poster, for free, here. While the other posters in the series aren’t specifically food-related (there are other aspects to life, I suppose), they’re also worth a look. I especially love the bike-themed one. This series will address issues facing local farmers, producers, migrant and immigrant workers as well as look at labor practices throughout the food industry. Slow Food has laid out the goal of creating a food system that is “Good, Clean & Fair.” Fair is perhaps the most difficult of these to address as it strikes directly at the question of how we treat the people that produce and prepare our food, and has perhaps the greatest impact on the price of the food we eat. It is a difficult issue also because of how little it is talked about, and how brutal many of the details are. The first event will focus on the challenges facing local farmers and will feature Jeff Phalen from Persephone Farm, Jim Bronec from Praying Mantis Farm, and Ramon Ramirez from PCUN. Don’t miss the first event of what promises to be a thoughtful and informative series. RSVP: rsvp@slowfoodportland.com. See you there!